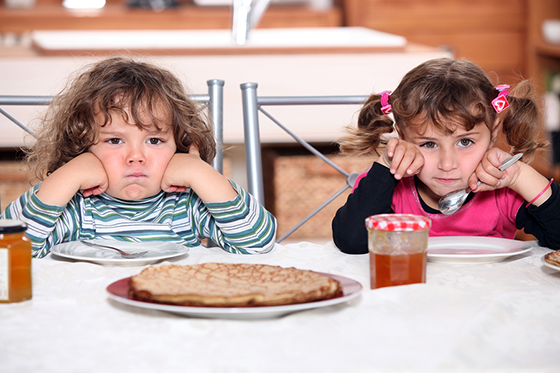 Tension at the table is one of the most common reasons families choose not to eat together. Whether it’s complaints about the food, a leftover fight from the day before, or lingering stress from a long day at work or with the kids, there are times that the dinner table can feel like a minefield. We understand. But you don’t have to live with tension at the table. Using the following tips from Anne Fishel,Ph.D. and our online program Food, Fun and Conversation: 4 Weeks to Better Family Dinners, you can now nip some of the most common dinner table stressors in the bud. This month’s newsletter also includes a stress-reducing quiche recipe, two fun, Thanksgiving-oriented activities, and age-appropriate conversation starters about gratitude. Let them choose: If the biggest struggle you have is with kids not liking the food, try empowering your children to find some recipes they like that have some of the ingredients you want them to eat. You might also try our My Plate tool, which gives kids a chance to design 5 go-to balanced meals so you always know what they will eat. Avoid topics that always result in a fight. Chances are, it will be easier to discuss issues like grades, curfew and behavior problems after dinner, once you’ve had time to connect. See our tip sheet on “challenging conversations” for more ideas on this. Focus on “the-good-enough-dinner.” Relax when it comes to manners, eating everything on one’s plate or staying seated for a long time. A fun time shared by all is the goal, not perfection. Look for openings to laugh and listen more. Take a minute to feel gratitude. At the end of a long day, it’s easy to focus on stressors and to-do lists. Take a step back and remember the positive. Did someone other than you set the table? Thank him or her. Thank your children when they make a funny joke or share a nice story about their day. Let the table be a place for expressing gratitude and appreciation. Try something special: Put on some special music, play a game, eat in a special place – anything to change up the routine and get the focus off of what feels like an old pattern and onto a new possibility. Foods such as berries, dark green vegetables, oranges, sweet potatoes, nuts and avocados are all good for reducing stress. (Of course, any food that everyone likes to eat will also increase enjoyment, and therefore decrease stress levels.) This month we’ve chosen a quick and delicious Quiche with some stress-reducing dark green vegetables from our Build Your Own recipes section. 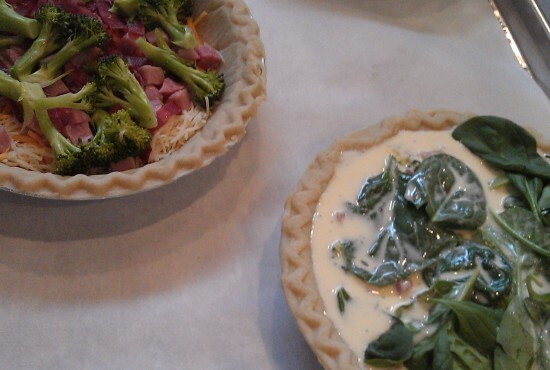 Yes, this quiche can be customized to suit different tastes, which as you know, also lowers tension. Enjoy! ABCs of Gratitude. When you think about it, on even our worst days, we can still find things to be grateful for. In this game, go around the table and have each member of your family share something for which he or she is grateful — but in alphabetical order. So maybe you’re thankful for animals, your son is grateful for bananas, and so on and so on until everyone is feeling gratitude from A to Z! Or if you’re looking for a more crafty type of Thanksgving activity to do with your kids, making an apple turkey is simple and fun. Anything else you think might work well on an apple turkey! As you can see, creativity is encouraged, and maybe an apple turkey competition is in order? And you can always use your apple turkey as a Thanksgiving centerpiece! Talk about two things for which you felt thankful or grateful for today. How do you feel when you receive thank you cards from your friends or when they say ‘thank you’? Why? In Winnie the Pooh, A.A. Milne writes, “Piglet noticed that even though he had a Very Small Heart, it could hold a rather large amount of Gratitude.” What might Piglet or your favorite storybook character feel thankful for? 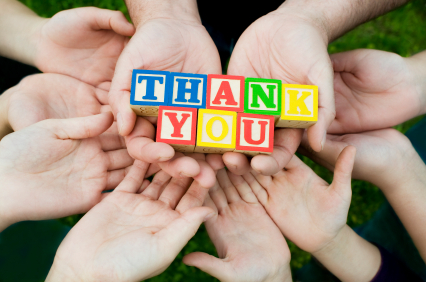 When is it especially important to say ‘thank you?’ Do you notice when people thank you, or forget to thank you? Novelist Marcel Proust wrote, “Let us be grateful to the people who make us happy; they are the charming gardeners who make our souls blossom.” Who are your ‘charming gardeners?’ Why? What is your favorite thing in the world to do? Why? How would you feel if you couldn’t do it anymore? Gertrude Stein said, “Silent gratitude isn’t very much to anyone.” Describe the most creative way you’ve ever expressed thanks to someone, or someone has expressed thanks to you. How has your understanding of gratitude changed over the years? What did you feel most grateful for when you were younger? And today? Do you think gratitude can be taught? If yes, how might you teach it to someone younger? Stay tuned for some special Giving Tuesday announcements coming later this month! 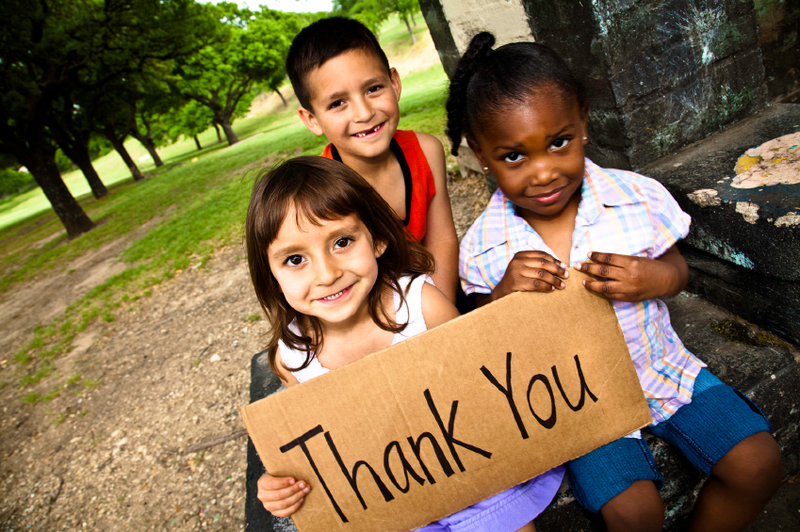 Giving Tuesday is a campaign to make the Tuesday after Thanksgiving (December 3rd this year) a national day of giving. The Family Dinner Project is participating by providing tips and tools to help spark conversations about giving around the Thanksgiving table and beyond. We’re not just talking about giving money, but also about giving time and simple gifts of kindness. After all, Thanksgiving = Thanks + Giving, right? In partnership with Giving Tuesday, we want to help more families make both giving and the family dinner year-round traditions. We hope you’ll join us!